We’d love your help. Let us know what’s wrong with this preview of The Phoenix Project by C.A. Gray. The haven city of Beckenshire has been demolished, and most of the rebels lie beneath the rubble. The few that remain scramble to communicate with the outside world, knowing that if they are to stand a chance in the coming war, they can’t do it alone. In a last ditch effort to grow their ranks, the remaining rebels systematically destroy the repeaters which help to propaga The haven city of Beckenshire has been demolished, and most of the rebels lie beneath the rubble. The few that remain scramble to communicate with the outside world, knowing that if they are to stand a chance in the coming war, they can’t do it alone. In a last ditch effort to grow their ranks, the remaining rebels systematically destroy the repeaters which help to propagate the control center signals. And it’s working: citizens in targeted cities are waking up in droves. But Ben Voltolini will stop at nothing to quell the uprising before it has a chance to get off the ground. And he has one major ace up his sleeve: Kate Brandeis. To ask other readers questions about The Phoenix Project, please sign up. 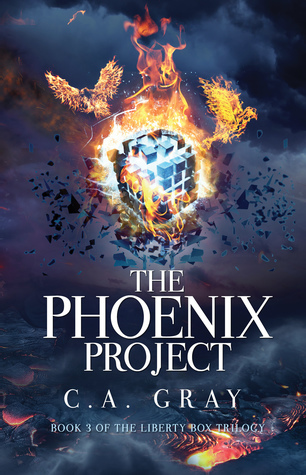 The Phoenix Project brings to a conclusion The Liberty Box Series of books by C.A. Gray. It is difficult to review the final book in a series without giving away the plot or too much information on the previous books. As this series draws to a close the battle between the resistance and the government run by Voltolini and his mind control network rages on. The resistance is small and grows smaller as members are arrested or killed. The majority of the population remains blind to the world as it The Phoenix Project brings to a conclusion The Liberty Box Series of books by C.A. Gray. It is difficult to review the final book in a series without giving away the plot or too much information on the previous books. As this series draws to a close the battle between the resistance and the government run by Voltolini and his mind control network rages on. The resistance is small and grows smaller as members are arrested or killed. The majority of the population remains blind to the world as it actually is and sees an altered reality that Voltolini has programmed. The Phoenix Project wrapped up the series well, tying up loose ends and bringing everything to a satisfactory conclusion. Gray’s writing throughout the series flowed well, making for books that were delightful reading experiences. Amidst all the fun, she also wove in some metaphysical concepts to add some depth and complexity to the story. I think my biggest issue was the overall pacing among the three books. The Liberty Box had a slower start and felt like a lot of set up for all the action in T The Phoenix Project wrapped up the series well, tying up loose ends and bringing everything to a satisfactory conclusion. Gray’s writing throughout the series flowed well, making for books that were delightful reading experiences. Amidst all the fun, she also wove in some metaphysical concepts to add some depth and complexity to the story. I think my biggest issue was the overall pacing among the three books. The Liberty Box had a slower start and felt like a lot of set up for all the action in The Eden Conspiracy. And The Phoenix Project introduced a lot of new drama that felt a bit forced and like filler at this later stage. Altogether, I would have preferred a more unified feel amongst the three books. That all being said, The Phoenix Project, and The Liberty Box trilogy as a whole, was highly entertaining with some fascinating scientific and philosophical ideas. I’d certainly be interested to see what else the author has to offer. The second book of this series ended with a perfect cliffhanger, so naturally I was very excited for this book to release, and it was all I dreamt of. When The Phoenix Project started off, I was quite frustrated, but in a good way. The atmosphere was tense and it was a complete page-turner, I was captivated by how fast the world pulled me into it again. I read the whole thing in one sitting; the thrill and suspense not letting me put the book down at all. I absolutely adored Jackson in this book. He was so kickass and sweet and just amazing. Sometimes stories like these get a little overwhelming either on the romance part, or on the action. But I love how balanced this series is, it has the perfect dose of everything. I have admired certain things about this series from the beginning, one being the inclusion and treatment of science. Sci-fi books these days tend to go so off-track, but the author showed great skill while incorporating the science factors in the story, it was not very complicated, but just enough.However, I do wish I could connect a little more to the characters. Wow. I cannot believe that this is the last book in the The Liberty Box series. It has been quite a ride. There is no denying that C. A. Gray is a great storyteller. This book was as captivating as the last two, what with all the action and plot twists. I thought that I could pretty much predict the storyline in this last book, because, y’know, what else would they do other than start a revolution against the Potentate? What I didn’t expect was for Gray to sprinkle little plot twists here and there which, okay, didn’t really blow my mind or anything, but definitely caught me off guard. “You might have the power to suggest ideas to me, but you don’t have the power to make me accept them.” -Jackson. The book was, as usual, action-packed and thrilling. It was unputdownable and I probably would’ve finished it in a few days if I wasn’t busy with work and family stuff. I really loved how Kate’s character grew to become stronger and more independent as she relied on herself to get out of sticky situations or to put things right. “Emotions make great servants, but terrible masters.” -Kate. I’m still not a huge fan of the romance in this series. It just doesn’t feel right to me, there’s barely any chemistry between Kate and Jackson, in my opinion. Other than that, this was a thrilling, unputdownable read. I've been looking forward to reading The Phoenix Project since I finished The Eden Conspiracy, and it did not disappoint. The Phoenix Project is a strong finish to a stellar series, and I have nothing but good things to say about it. The entire series is pretty action-packed, but The Phoenix Project really raises the bar. I was on the edge of my seat at times, and I had goosebumps at the end. It's been a long time since I've had such a strong reaction to a book. I was so happy to get closure, I've been looking forward to reading The Phoenix Project since I finished The Eden Conspiracy, and it did not disappoint. The Phoenix Project is a strong finish to a stellar series, and I have nothing but good things to say about it. The entire series is pretty action-packed, but The Phoenix Project really raises the bar. I was on the edge of my seat at times, and I had goosebumps at the end. It's been a long time since I've had such a strong reaction to a book. I was so happy to get closure, but on the other hand, I was sad that it was over! I didn't want to say goodbye to these characters, but I was pleased with how things turned out. There is such wonderful character development throughout the series, and I love how much Kate has changed from the beginning. The world building is creative and imaginative, and it was so easy to get lost in the story. The author has a talent for subtly drawing you into this world with her incredible writing. And I have to mention the cover - it's gorgeous. Definitely my favorite of the three covers. The Phoenix Project is an intelligent, entertaining, and well-written dystopian, and I would highly recommend checking out this series! Oh my....my heart nearly stopped. Dozens of time. Kate is probably one of my favorite characters. Ever. Her ex-fiancee thought she was a doll, but she proved herself to be so much more. And Jackson,oh my. I NEED a Jackson. This book and the whole series in general is amazing. Pick it up. It's so hard for reviewers to not leave spoilers that I'm doing my level best to just say that the best thing you can do is read the series. But do keep some tissues on hand. You may need them. Happy Reading!! I was sent the arc of The Phoenix Project in return for a honest review by the author. I loved this book and I dare say it is my favourite of the trilogy (The Liberty Box). All the covers for the trilogy are beautifully designed and created. Much like this is my favourite book of the trilogy; the book cover is also my favourite. Will, again, is very well written but I still love to hate him. He is controlling over Kate and makes decisions for her without asking her opinion. Ka I was sent the arc of The Phoenix Project in return for a honest review by the author. Kate has grown up a lot from the first book. She's much more independant and strong. She stands up for herself against Will and Voltolini. Despite the struggles she faces. Jackson is by far my favourite character. He sees what others can't, is strong, determined and logical. Part of Kates journey in finding herself I dare say is thanks to Jackson. Having the different character perspectives throughout the novel helps to build upon the story and see how they each play a role into the plan to destroying the Liberty Box. Kate overcomes many obstacles and challenges in this book. The fight towards freedom reaching its climax. This is the third and final book in “The Liberty Box” trilogy. I thought it started a little off pace and I was fearful that the author wouldn’t give us a strong finish. I needn’t have worried my pretty little head. WOW! If you’re reading this in a chair, I’d advise you to be sure it has seat belts by the time you get to chapter 3. The pace picks up and there are so many turns of fortune that this could have been split into two books. I found myself unable to put it down, rushing to a finish that This is the third and final book in “The Liberty Box” trilogy. I thought it started a little off pace and I was fearful that the author wouldn’t give us a strong finish. I needn’t have worried my pretty little head. WOW! If you’re reading this in a chair, I’d advise you to be sure it has seat belts by the time you get to chapter 3. The pace picks up and there are so many turns of fortune that this could have been split into two books. I found myself unable to put it down, rushing to a finish that I knew I’d regret. When I turned the last page I was saddened that there was no more. I love the clear eyed view this author has of humanity. The tale is a metaphor for current events, and the direction we are headed. This final book in the trilogy wraps up eveything nicely with an ending that is extremely satisfying. I have thoroughly enjoyed reading the whole series. Entertaining and intriguing. I loved the plot twists in this book. And the writting was very well done, as usual. The main characters have to overcome many obstacles in this book. The fight for freedom picks up a lot of momentum and a new character's appearance changes everything for the rebels. I received an ARC of this book from the author in This final book in the trilogy wraps up eveything nicely with an ending that is extremely satisfying. I have thoroughly enjoyed reading the whole series. Entertaining and intriguing. I loved the plot twists in this book. And the writting was very well done, as usual. This ended perfect, I am so glad Will left and Kate ended up with Jackson! The characters in this series you feel real love and hate for. This is probably my favorite cover of any of the books I've written, and not only because it's a study in contrasts. The poetic idea of the phoenix rising from the ashes seemed to capture the essence of what my rebels faced at the conclusion of The Liberty Box trilogy. Jackson is in prison, slated for execution; Kate is brainwashed all over again. They keep losing more and more of their ragtag band of rebels, when there weren't that many of them to begin with. Allies become enemies. Just when yo This is probably my favorite cover of any of the books I've written, and not only because it's a study in contrasts. The poetic idea of the phoenix rising from the ashes seemed to capture the essence of what my rebels faced at the conclusion of The Liberty Box trilogy. Jackson is in prison, slated for execution; Kate is brainwashed all over again. They keep losing more and more of their ragtag band of rebels, when there weren't that many of them to begin with. Allies become enemies. Just when you think the odds are as bad as they can possibly get... they get worse. But my favorite stories are always like that. Narratives are all about contrast--the more impossible their situation, the more spectacular the redemption. I loved “The Phoenix Project”! I was intrigued by the title even. I started making my own assumptions before listening to the audio and I was making scenarios which, one by one proved to be wrong. Because “The Phoenix Project” has such an unexpected action and such unexpected reactions! And the Potentate has such a great mind (well, excuse me for liking a negative character!) and manages again to be one step ahead of the rebels. Most of the book is focused on how Kate is trying to understand what I loved “The Phoenix Project”! I was intrigued by the title even. I started making my own assumptions before listening to the audio and I was making scenarios which, one by one proved to be wrong. Because “The Phoenix Project” has such an unexpected action and such unexpected reactions! And the Potentate has such a great mind (well, excuse me for liking a negative character!) and manages again to be one step ahead of the rebels. Most of the book is focused on how Kate is trying to understand what is real and what is not, after the events from the previous book. We see a Jackson that is defeated by his own expectations from other people. We understand now his weakness. He is indeed human. And what’s new, we have a new perspective. Will’s point of view is not only capturing what happens on the other side of the palace, but at some point, he is the voice of the person who just wants a quiet life, nothing more. We meet the creator of the Liberty Box technology and we see his conflict. Yes, this book deals a lot with inner conflicts, but this is very well blended with the action. There were some things I did not enjoy, but not enough to make me decrease my rating. It frustrated me how Jackson blamed Kate for some things she could not control. It frustrated me seeing the doubt so much, but I understood that this was built in such a way to tie everything together. So points for that as well. The narration was good to some extent. There is almost no voice acting and that would not have bothered me, had it not made me confused about who was talking. However, the narrator did manage to express the anger and the dissimulation some characters shown throughout the story. Especially the anger part. It would be fair to say that The Phoenix Project neatly wraps everything up for the trilogy and so it does but that doesn’t really do the author justice. A lot goes on in this last volume and I got to know the characters even better, not always pleasantly. With Kate being held in pampered captivity and seemingly completely under Voltolini’s sway, Jackson in the deepest of dungeons and the remnants of the resistance in tatters, it would appear that all is lost and the dictator has won but some of It would be fair to say that The Phoenix Project neatly wraps everything up for the trilogy and so it does but that doesn’t really do the author justice. A lot goes on in this last volume and I got to know the characters even better, not always pleasantly. With Kate being held in pampered captivity and seemingly completely under Voltolini’s sway, Jackson in the deepest of dungeons and the remnants of the resistance in tatters, it would appear that all is lost and the dictator has won but some of the rebels have a different plan. At the same time, Kate discovers Jackson in his cell and begins to doubt her thoughts, her implanted belief that he is a murderer and the cause of all that is wrong. Meanwhile, Jackson has his own doubts about himself but meets another prisoner who just might turn out to be a critical piece of his, Jackson’s, redemption. In this third book, I came to dislike Will more and more as his need to control everything, especially Kate, became increasingly obnoxious. This man truly needs to be set straight about how to behave towards women and he really is kind of stereotypical but, truthfully, he was not my most detested character. That honor goes to Denise (I think that’s her name), Kate’s mother but I’ll leave it to you to find out why—I assure you it won’t be hard to figure it out. As for Jackson, I came away understanding that he is, indeed, very human and not a superhero, making him very likeable indeed while my empathy for Kate intensified even as I wanted to throttle her sometimes. Narrator Melissa Williams still isn’t my favorite reader because she doesn’t differentiate voices all that well but I still enjoy listening to her. Her tone is very pleasant and I think her vocal strength comes at those times when characters are losing it. In particular, her shrill tones with both Will and Denise made their distress very evident. Damn and I thought book 2 was awesome but this book 3 tops it. When some rebels died or were captured because of Kate's broadcast, what do they do now? Everyone is losing hope and because of the brainwashing still going on. Jackson is such a wonderful character and I felt so bad for him and Kate. When Voltolini trys to explain his side to Kate about everything, what can she really trust? Because her whole life she was told and shown how life is. But when finally has her has opened and the brainwashing gets broken whom can she trust? Will kate be able to help Jackson get free? Will she get free and can Jackson trust Kate again? This whole whole book I was like come on rebels take them down. Last book of the Liberty Box trilogy. These three books need to be read in order and you will want to read them all. They don't work as stand alone books. Characters are fleshed out, story is well written. There is no swearing or sexual content, there is violence. I really liked this set. Got the first one free and had to buy the next two. I give The Phoenix Project five stars and can recommend for teens and up. Yes! With this satisfying conclusion, I finally found myself enjoyed the story fully no matter who's POV I was reading. Not to mention the exciting ending! While not my favorite Dystopian, this one has some amazing scenes and plenty of action and intrigue. A fun series to read if you like dystopia type stories. My favourite book in the trilogy! Huge thanks to the author for providing me with an ARC. This was one of the most satisfying endings to an excellent series. Well written - well paced, surprising but not disappointing, well plotted, and with all the right folks surviving at then end... it was perfect. There were all the right twists and turns, the right balance of characters and action. It was notneedlessly dragged out just to get the page count up - or worse, to stretch a fourth (or more) book into what was a well planned trilogy. It was great reading on the elliptical machine on th This was one of the most satisfying endings to an excellent series. Well written - well paced, surprising but not disappointing, well plotted, and with all the right folks surviving at then end... it was perfect. There were all the right twists and turns, the right balance of characters and action. It was notneedlessly dragged out just to get the page count up - or worse, to stretch a fourth (or more) book into what was a well planned trilogy. It was great reading on the elliptical machine on the gym - I couldn't put it down and that meant extra workout time. I have struggled a little with the YA-dystopian sub-genre lately. They seem to be well written in the beginning, or at least interesting enough to hold my attention, and then 'wham' something happens that makes me regret having read the entire series. That was not the case here. I was so happy with the way the story ended, the fate of each of the characters felt right, and it didn't feel contorted or as if the author didn't know how to end things so the characters ended up being ridiculous (**cough, cough** Divergent **cough, cough**). The other thing that this series, and especially this book, illustrated is the power of suggestion, the power of brain washing, the power of only hearing one side of a story, the power of the mind. It is so very hard to re-train the brain, even when what was learned in the first place was not real. It takes great strength of will and character to be open to other perspectives, even when the other perspective is the reality. This book never looses sight of the broader plot, never stretches things so that the next steps taken by each character doesn't feel logical (even if at times it was frustrating to watch the characters make the choices they were making), and most of all, met the expectations set by the first 2 wonderful installments of this series. It was awesome and wonderful, and I would read it again. In my book this author is on a roll - 2 wonderfully delightful series - with not a single let down in 6 books! And, it is not often that is the case. Thanks for the read C.A. Gray! Keep up the excellent work!